This is a Post from the Symbol Surfing Blog from Tue, Jul 10, 2018. I was scanning my list of low pe stocks last night. I saw a few buying opportunities there, but the one that stood out the most to me was Mohawk Industries. It's P/E Ratio is 4.38. That's pretty low. 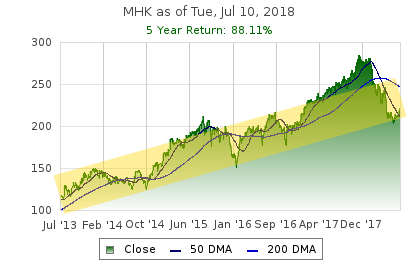 Also, MHK has a $16 Billion market cap. You may have seen their products at Home Depot and Lowe's. By the way, both HD and LOW are near all-time high levels. So let's look at some technical analysis. As you can see, the trendline I highlighted shows a long-term uptrend trading range. More importantly, the stock price has recently bounced off of the bottom of the trading range or support. Let's look at that closer. 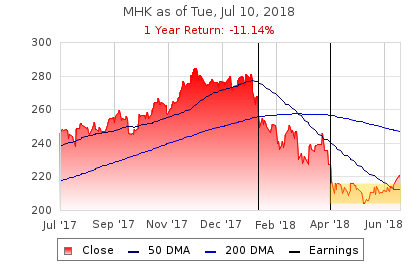 The 1 year chart looks pretty bad. After climbing the first half of the year to a record high, the stock has dropped significantly after each of the past 2 earnings dates which are the black vertical lines. The area I highlighted in yellow is what I think could be a bottom as well as a reversal. The price has started to move higher through the 50 day moving average, which is also bullish. All in all, that's why I bought today. This is a setup that I really like. I am hoping to make $10 or more on this trade. Of course, there is the Trade War risk, but I am wondering if that is not already priced in. The stock has dropped from $280 to $220. The next earnings date is Wed, Jul 25, 2018.